Wow! What an interesting experience testing these two upstarts side by side. There are phenomenal quality differences in numerous areas between the Olevia and Vizio LCDs. The contrasts could not be more defined. There are several concern areas to look out for in each unit as well. And there are positive attributes in each LCD. Both LCDs are 1080p and both entered the market in the U.S. and Canada in early 2008. The Olevia is made in Taiwan and the Vizio LCD is manufactured in China according to the company. Olevia established a name for its product a couple of years ago by offering quality LCDs at lower prices than Sony and Samsung. Vizio took on much the same strategy by partnering with manufacturers in Taiwan and focusing on sales to discount retailers like Costco and Wal Mart to become the 3rd ranked seller of LCDs in the U.S. in 2007. Shadow Detail was better on the Olevia (pictured right). For comparison sake following is where these two LCD televisions fall in the quality order of their manufacturer’s lineup. The Olevia 242T FHD is a series 2 Olevia TV and is a price competitive lower tier model. In fact, it is the lowest tier TV they make in 1080p surpassed by their 3, 5, 6 and 7 series TVs. The Vizio VW46LF is a middle tier quality and price model surpassed by Vizio’s GV and VO series lines. The VX Vizio models are their lowest tier LCD TVs. (The Vizio LCD has a very strong Backlight which was preset to 90. For brightly lit rooms adjust the backlight up to 50 or more but keep in mind, blacks will suffer more as a result). This calibration will get us to within plus minus 195 of D6500K. Olevia LCD – The 242T’s contrast is listed at 1600:1 in the manual. With our checkerboard pattern test and post calibration we measured it at 265:1 which is good for an LCD. During content viewing the contrast ratio superiority of the Olevia was evident and helped the Olevia in almost every picture comparison category. (Note: there was some light bleed in into the blacks in the lower left quadrant of the Olevia panel). Vizio LCD – Vizio lists contrast ratio for the V46L at 2000:1. Our checkerboard pattern tests put the post calibration contrast at 180:1. This is a poor contrast especially for a 1080p TV. Vizio LCD – We used the recent release of S.W.A.T. by Columbia Pictures for our testing in High Definition resolutions. Though a pretty lousy movie the video production is solid and displayed well on the Vizio. The greenish/yellow caste was still present but less noticeable and the contrast looked much better. Response rate time appeared to be an area of concern. Vizio does not list a response rate figure but there was a lot of jerky motion during fast scenes and obvious motion blur. Occasionally, the Vizio picture looked washed out during bright scenes. The 1080p picture image also appeared much too flat and less realistic in color presentation. I expect a much more 3-dimensional effect when viewing high def. One impressive note in comparison to the Olevia is that there was little to no light bleed into the top and bottom black bars. They remained black with the high def signal. Olevia LCD – The considerable video noise problems experienced with the 480i signal largely disappeared when viewing HD signals. Black Levels were very solid and contrast popped. Dark scenes lean toward a blue caste but not disagreeably so. There was a slight jerkiness when panning side to side across some of the scenes in S.W.A.T. There was also visible light bleed into the black bars top and bottom the picture. However, the Olevia displayed a much more 3-dimensional and realistic picture image with 1080p signals. The aspect ratio sizing looked better. The color was accurate. Another advantage of the Olevia LCD is a 1 to 1 pixel aspect ratio adjustment for 1080p content that displayed wonderfully. Olevia LCD – Up conversion and processing from a film source from 480i was a real challenge for the 242T. I really can’t describe how poor it was, with so much motion artifact and dithering video noise with any movement from our displayed Dreamworks widescreen enhanced release of Perfume. Throughout the film the Olevia’s poor processing and presentation of the DVD distracted me. Horizontal and diagonal lines on objects waver as the picture pans. And indeed with our HQV Silicon Optix Benchmark Video Resolution Loss Test, considerable artifacts showed up. When testing the diagonal filter in the Olevia we got a similar result with "jaggies" showing up prominently near the horizontal axis. During the Film Resolution Loss Test the Olevia LCD had substantial flickering. Corners have been cut with the video processing chipsets in this LCD television and the resultant picture suffers when upconverting from 480i and lower signals. processing using a 480i input signal. Vizio LCD – The Vizio had a far superior video processing chip set and digital comb filter and did a good job smoothing images from the incoming 480i signal. There was still a little background noise in some scenes but it was slight. There was pixel flicker visible from less than 6 feet in a few cases, but overall the scaling and processing component of the Vizio LCD was very impressive. With our HQV Video Resolution Tests, the Vizio VW46LF performed very well with little noticeable "jaggies" . 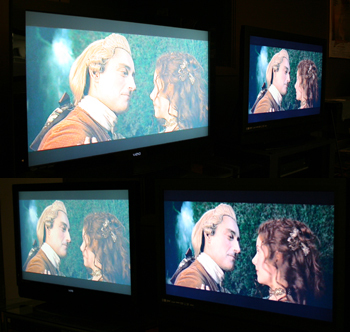 One drawback during our playback of the DVD Perfume was a yellow/green tint to the Vizio picture that persisted throughout the entire movie. A second drawback during 480i playback was a washed out picture image especially at off axis viewing angles. Black Level/Contrast: The Olevia LCD had very solid black levels for an LCD TV. Contrast was sharp. The Vizio had challenges showing a true black with a 480i signal, blacks and dark matter appeared washed out. This issue improved significantly when viewing a 1080i or 1080p signal. Dark Shadow Detail: With a 480i signal, the Olevia was again the clear winner. Shadow detail was quite good with any signal. The hazy effect the Vizio TV produced with lower end signal decreased detail in dark scenes. Color Rendition/Color Accuracy: The Vizio LCD calibrated much closer to D6500K – the optimum color temperature for viewing. However, when viewing video content I was distracted by the green/yellow overcast on much of the programming we viewed. I generally preferred the Olevia’s color rendition with our tested content. The Olevia LCD had a decent calibration. Mid to brights were solid. With a darker picture the Olevia will produce a slightly bluish image – but realistic. Flesh tones also looked much better on the Olevia. Viewing Angle/Off Axis Viewing: With a 480i input signal the Vizio LCDs Contrast and Black Levels begin to degrade at a mere 25 degrees – a poor performance. At 45 degrees the viewer has lost around half the contrast in the picture. The viewer really needs to be straight in front of this HDTV to see its full picture quality. The Olevia LCD TV performed much better in viewing angle comparison. Blacks begin to lose their depth at around 40 degrees off axis. For an LCD viewing angle was overall very solid – partly due to the better contrast and LCD panel quality. Comparing the view angle on the two TVs. contrast during our off-angle viewing test. Motion Lag: Both LCDs had issues with motion lag. During our screening of Perfume the Olevia 242T showed lots of visible jerkiness and vidio dithering during scenes with fast movement from a 480i signal. The Vizio VW46L fared little better with motion blur and jerkiness evident throughout motion-oriented images even with 1080p signals. False Contouring/ Mapping: Mapping and banding was very apparent in scenes during the 480i control test with the Olevia LCD. This means that it will also be noticeable with lower end cable or satellite signals. The issue was non-existent with 1080i or 1080p signals. The Vizio LCD performed well in this category with no negative points to note. Exceptions note: The Vizio VW46LF does not sync with the Blu Ray BDP-S1 DVD player through HDMI output. We instead used our Playstation 3 to test 1080p signals with this TV. Aspect Ratio Sizing Considerations: The Olevia LCD had a very solid aspect ratio lineup including dual zoom and pixel by pixel modes. The aspect algorithms in the Olevia 242T performed in a realistic manner. The Vizio LCD has 4 aspect ratios. The Wide mode will be preferred for most programming. Inputs: Both brands contained adequate inputs. The Vizio LCD has 3 HDMI inputs and also contains a VGA 15 pin input. The Olevia LCD has 2 HDMI inputs, but it also as a firmware upgradeable USB port and a RS232C input. Aesthetic Considerations: The high gloss black frame and stand of the Vizio VW46LF is attractive if that’s a look you like. The undermounted speakers have the patented V shaped design. The framing bezel is 1.7 inches on top and about 2 inches on the sides with the undermounted speakers at about 4 inches. The total depth of the unit is about 4 inches. The only real drawback is that light reflecting off the frame can distract while viewing. The Olevia 242T LCD is matte charcoal black with undermounted speakers. The framing bezel is 2 inches top and sides with the bottom mounted speakers adding 4 inches. The depth of the LCD is a less than slim 4.72 inches. The bottom mounted speakers are detachable but appear somewhat awkward on the unit with an open line between the LCD panel and the speakers. 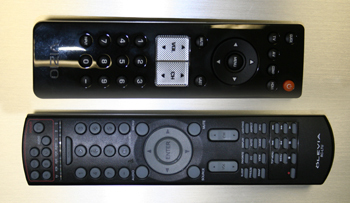 Remote Control: The Vizio remote is a good size, gloss black, has no backlighting, and imcomplete functionality. It does not even have an aspect ratio button. The user must enter the menu of the TV to change this function. The Vizio remote is a failure in many regards. The Olevia remote has plenty of function keys including sleep function key, freeze function key and aspect key. Depressing any key activates the backlighting for the remote buttons. Menu functionality: Neither of these LCD TVs has discrete picture settings for different inputs which is a major drawback. Both companies have good manuals with Vizio’s having the better layout and design. Olevia LCD – The 242T has no numerical values for settings. There is only one picture setting. The menu wheel is inadequate, quirky and difficult to use and understand. The menu wheel actually got stuck at one point forcing me to restart completely to get it functioning again. Though the actual number of functions is solid, the menu system design and setup is a failure. Vizio LCD – Finding the Wide menu option in the set up portion of the menu is not easy, but this must be done to change the aspect ratio. At least there are numerical values for the picture settings. The menu is easy enough to navigate though there are no on screen instructions directing the user to press the right arrow key to change menu settings. There is a lip sync function feature. Olevia LCD – There was very good sound separation and virtual surround effect from the two 15W X 15W internal detachable speakers. Menu options for treble, bass, balance were clear, however the major drawback was the volume output from the left/right speaker inputs. From just 10 feet viewing distance with the output maximized I was perfectly comfortable. Volume levels increased and was plenty sufficient when using the HDMI input. The 47" Olevia LCD has 20W X 20W speakers by comparison. Vizio LCD – The Vizio’s 10W X 10W speakers sound tinny, distant, and hollow. I was underwhelmed by the quality and volume output. Olevia LCD: The service department can be reached at 1-866-965-3842. The warranty only covers the original purchase and is on year parts and labor. In order to qualify for warranty service, you do have to register within 30 days of the purchase. Some models have in home service (which may not be available in all areas). The 2T (except 226T) series offers in home service for all models 32 inches and larger, while the 7 series offers in home service for 42 inches and above. All other TV’s will have to be shipped at the customer’s expense. Vizio LCD: Once the TV is out of the retailers warranty period (typically 1 month) the following is Vizio’s warranty policy:You can contact Vizio support at 1-877-698-4946. They offer a "limited" one year parts and labor warranty as long as the product was purchased new from an authorized Vizio reseller. 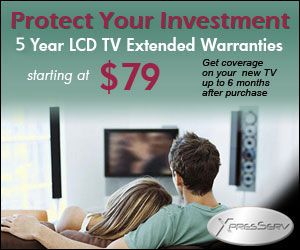 The repair and replacement of your TV will be at the sole discretion of Vizio. Any shipping cost will be at the customer’s expense. According to their warranty information, they offer in home service for TVs 30 inches and above for problems that can be repaired on site. "The determination for performing on-site repair is dependent upon the manufacturing defect and is at Vizio’s sole option and discretion." Repairs may be made with new or recertified (i.e. used) parts. The Vizio TVs are serviced through a third party, unless they must be shipped back to the Vizio service center in Irvine, CA. From our past experience and reports, most manufacturer defects with TVs must be serviced in a service center and cannot be repaired on site. Thus, the customer will be responsible for safe transit of the TV to Vizio’s service center in California ad back. Advice? Don’t throw the box away. Note: To read our complete information on the service of these two brands click here. The Olevia LCD had the better feature set with more aspect ratio options, a freeze mode feature, sleep feature, favorites feature among others. Also, the backlight (room light) control right there on the remote control is a big plus. The Vizio VW46L LCD has very limited extra feature options. much faster response time and better colors. It's no secret that HDTVs are used nearly as much for video gaming as for TV and movie viewing these days so I hooked up our Sony Playstation 3 to both LCDs to see which one fared better for high definition gaming. The games tested were Call of Duty 4, Heavenly Sword and Motorstorm. The toughest test for motion lag is the fast paced, first person shooter Call of Duty 4. You are constantly moving your view around and on the Vizio I had trouble spotting targets due to the excessive smearing from motion lag. The Vizio's brightness helped with fighting in dark areas but the colors looked better overall on the Olevia. Motorstorm and Heavenly Sword performed well on both sets, since the camera is pretty static in these two the motion lag isn't as apparent but could be picked out when making hard turns in Motorstorm or during some of the faster parts of Heavenly Sword. Both TV's looked good playing the games but the Olevia's better black levels and motion performance make it the winner for gamers choosing between these two LCD TV's. At large discount retailers such as Target and WalMart, the Olevia 242T is currently selling for around $1050.00. Keep in mind this is for a 42" TV. This lands the Olevia around $100 to $200 less than an LG, Toshiba, or JVC 42" 1080p LCD. The Vizio VW46L sells for around $1350.00. This is a 46" LCD TV. So the Vizio is selling at a $100 to $300 discount from brands like Samsung, Toshiba, and JVC so is slightly more competitive. Given the size difference Vizio and Olevia are very comparable in value. How good a value are they in the market? That depends upon how much quality you get for the price. We see some major weaknesses in both, but also some strong points for discount LCDs. I put them both at a very mediocre value compared to other top selling LCD TV brands such as Sony, Samsung, Toshiba, Philips and LG. Price is an especially important component for these 2nd tier brands. My value ratings here are falling in line with my picture quality ratings above. Review Equipment Used: Sony BDP-S1 Blu Ray player, Sony Playstation 3, Sony DVP-S50 DVD player (two), JVC HM-DH40000U HD Video Cassete player, Sencore Color Pro 5000, Sencore Auto Cal Pro, Sencore signal generator.